Although there are plenty of free online resources that will tell you how to get from your house to the store, for true long-distance mapping and trip planning—with Global Positioning System (GPS) integration, multiple stopping points, and information on highlights along the route—you need something more powerful. With its GPS-enabled maps and gigabytes of road and location data, Route USA 2004 3.6, from Route 66, will guide you across the country, from busy highways to country roads, but it could still stand some improvement. When you hook up a Mac-compatible GPS unit to a PowerBook with Route USA installed, you’re ready to hit the road. The program had no trouble recognizing and communicating with my GPS unit. 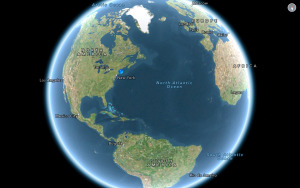 As soon as I had connected the unit and activated the GPS function in Route USA, the software began downloading GPS data and displayed my location on the map. You can input route waypoints (GPS latitude and longitude markers) with the push of a button. And real-time GPS means that you can track your progress on a route, recording changes while you drive. Although you have to get used to its somewhat puzzling four-panel interface, Route USA’s maps are extremely comprehensive. In addition to main streets and highways, it also listed unpaved logging roads in a wilderness area I was headed to. The program clearly marks and duly routes you around one-way roads and other potential pitfalls. Even better, it summarizes trip data, not only listing projected mileage and driving time, but also automatically generating fuel-cost estimates. Route USA is loaded with reference points to many useful locations, such as restaurants, gas stations, parks, and hotels, complete with addresses and phone numbers. It’s a snap to include reference-point data in a new trip plan, either by searching for specific information such as “hotels in San Francisco” or by selecting Hotels, for instance, from a pull-down menu. Route USA did run into some problems. For example, when I mapped a route from my San Francisco apartment to the Santa Clara Convention Center, I wanted to see if Route USA would prompt me to take the lengthier and faster route (about one hour) or the more direct one, which takes more time. Instead of choosing either, it routed me across the San Francisco-Oakland Bay Bridge—a trip that would take me far out of my way through heavy traffic and require crossing two bridges. Furthermore, the application tends to run very slowly. On a 1GHz PowerBook G4 with 512MB of RAM, map-redraw and route-calculation times were sluggish, sometimes taking nearly all the system’s processing power. And making changes to the default print settings is not at all straightforward and can be a time-consuming chore. Finally, I would have preferred the option of running the application from a CD or a DVD, rather than having to install 2.5GB of data on my machine. If you’re a GPS user, Route 66’s Route USA 2004 3.6 is a great tool for finding your way around a map in real time. The software’s extensive feature set enables comprehensive, if not easy, route planning. But people without a GPS device might want to stick with free online mapping tools such as Yahoo and Mapquest for now. The Complete Picture Route USA 2004’s route-summary feature gives you all the data you need about projected driving time, distance, and costs.